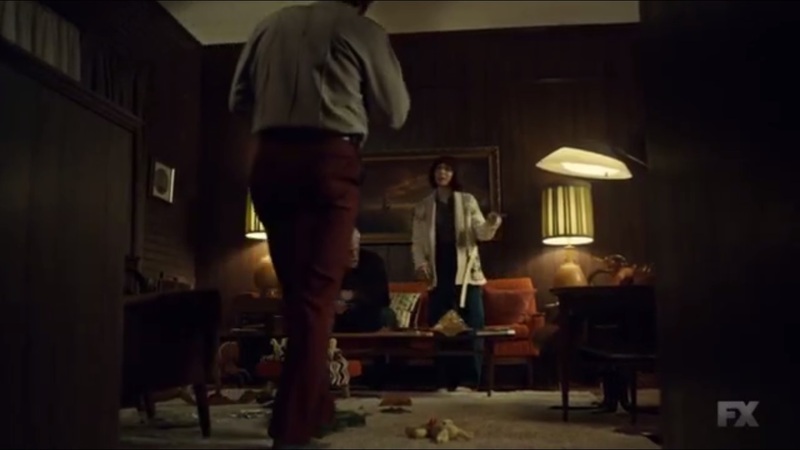 A Look at Fargo- Season 2, Episode 3: “The Myth of Sisyphus” | What Else is on Now? 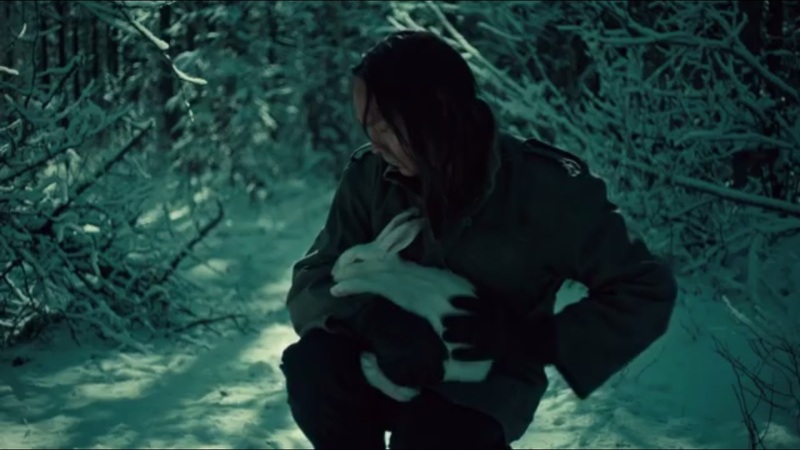 The episode begins with Hanzee petting a rabbit because as he remembers his school days when he watched a magician pull a rabbit out of a hat. One dead rabbit latter, Hanzee heads on his way towards the Gerhardt home. The Gerhardt family meets with three associates. Otto is present, but unresponsive. Dodd explains to the men that he had a stroke. Until he’s better, they talk to Floyd, as she’s in charge. The Kansas City offer does promise good money, but after you sign, Dodd says, your balls get taken with a straight razor and you’re fattened up like a housecat. That’s harsh. It’s their business, Dodd says. You can’t just write a check. Floyd argues that this family has been peaceful since Kennedy’s days. You don’t just pick up a gun and go to war with a Kansas City mafia. Dodd wants to hit the mafia hard or they’ll all wither and die. Floyd concedes that they may have to fight and she’s not afraid of a war, but if it comes to that, it will be on her terms as a last resort. She needs to know, now, if the men are with her. The men won’t say they’re going to war. Promises were made in blood generations ago. They won’t make the first move. But if Kansas City comes shooting at them, there will be hell to pay. At the Pearl Hotel, Joe Bulo has breakfast with a late Mike Milligan. They talk of shampoo brands since it’s hard to work the hair. Nothing on the Gerhardt family yet. Maybe kill them if the market says so, that or offer more money. All depends on what the market says. This Rye kid, though, apparently gunned down a judge, Mike says, then disappeared. 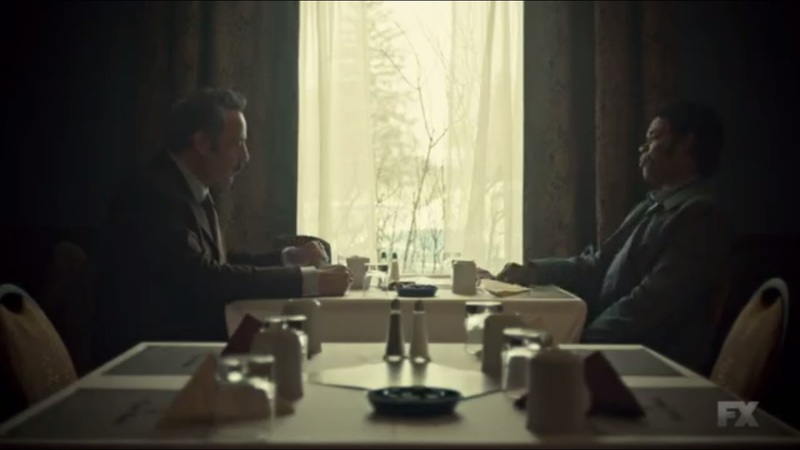 Maybe it’s for the best that he’s on the run, but Joe orders Mike- and only Mike- to find him for leverage. This way, they can hopefully avoid a firefight. In Luverne, Minnesota, Lou Solverson speaks with Hank to find out about the judge’s caseload. 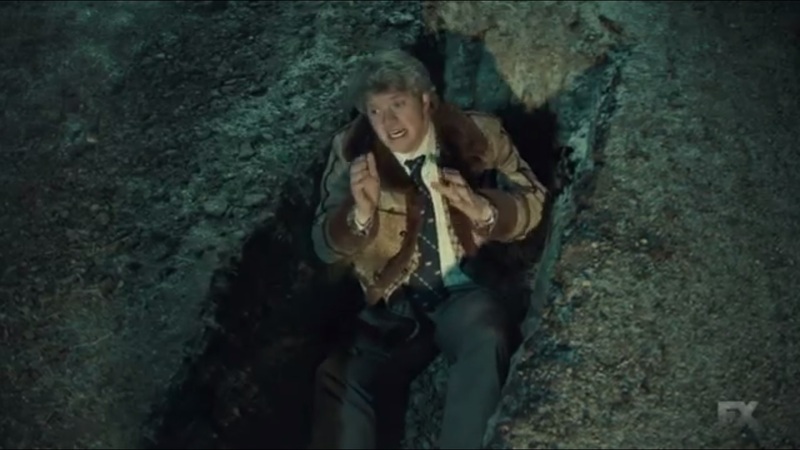 Hank is calling because of a print match on the gun, which belonged to a Rye Gerhardt- the youngest heir to the Gerhardt syndicate out of Fargo. Lou will mention it to Fargo police. And Lou will be a late, so he tells Hank to inform Betsy to not wait up for him. 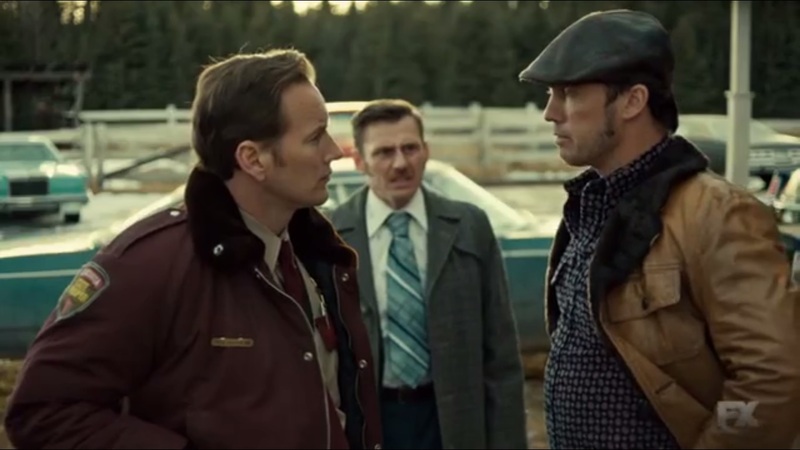 When Lou arrives in Fargo, he meets with a young Ben Schmidt, played by Keir O’Donnell, who works in Forensics. Ben is working things up here and hopes to drive over to see the crime scene himself, even though Lou offers to show the photos. When Lou mentions that the prints on the shooter’s gun belonged to Rye Gerhardt, Ben pays closer attention. 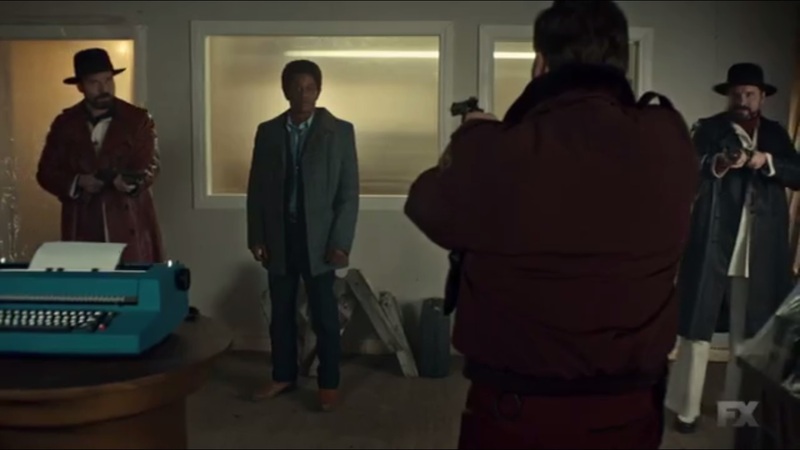 He’s not saying that Lou’s life would be easier if it were his prints on the gun, but that’s the lines along which he should be thinking, you know? Ben shares some history about the Gerhardt family. Otto took over after his father, Dieter, took 19 bullets in the head in 1951. Lou asks if Ben has heard of either Mike Milligan or the Kitchen brothers. They were sniffing around the crime scene, but there was no reason to hold them. Lou, we learn, served in the Navy- two tours as a lieutenant. Swift boat. Infantry for Ben, outside Da Nang. Both are familiar with Fubar- so when you put a dead judge, the Gerhardt family, and some hitters from Kansas City in a bag together, Be thinks that it may just be better to confess to the crime yourself and then go live a long life in a cell somewhere with hot and cold running water. So, back to the Gerhardt clan. Hanzee asks Simone about Rye’s location, and she eventually concedes to going there with a boy for some weed. Sometimes a girl just wants to bust a nut, she says. Were people saying that in the 1970s? But she spills that the location is over on 13th by the train station. Hanzee wants her to show him. Hank goes over the murder weapons and Rye’s wanted poster…and he still has the damn shoe on his desk. At the beauty shop, Betsy tells Constance that she’ll soon be losing her hair due to the chemotherapy. Peggy’s cousin had melanoma, yeah. Didn’t lose a single hair…except for her eyebrows. Peggy tells Constance that she’s agreed to attend the Lifespring seminar because she wants to be the best her that she can be. As for what Ed said? Well, Peggy sort of skipped out on that part. 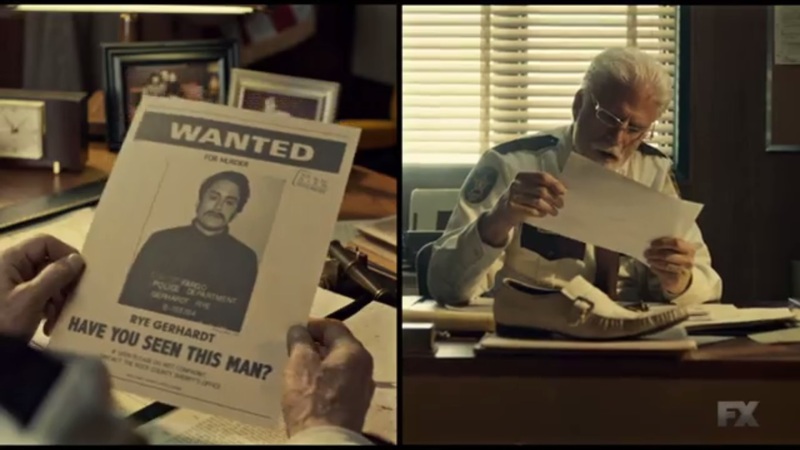 Then Hank pops in and lets Betsy know that Lou will be late tonight, but he’s also here to put up a wanted poster of Rye Gerhardt. To kill all of those people for a bit of money? Tragic. But Betsy gets to thinking about the shoe in the tree and the fact that the shooter left his vehicle behind. What if he got hit by a car? After all, there were glass and skid marks on the road. So what if the killer just got himself struck by a passing motorist? 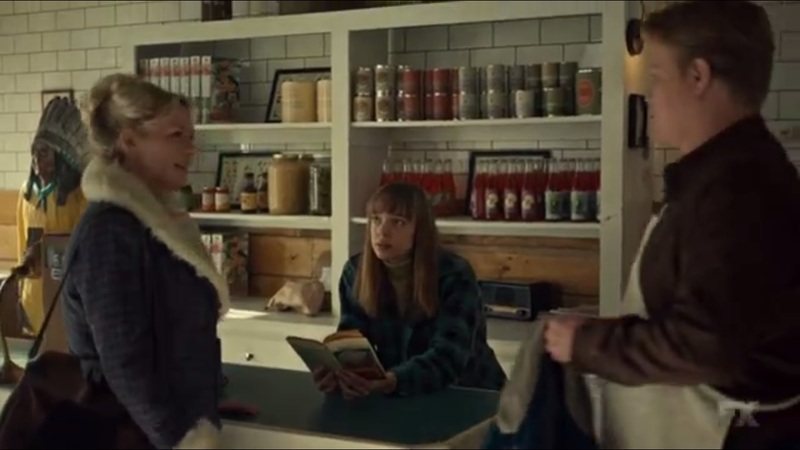 Before Constance can recall a similar incident involving one of the employees, Peggy argues that a motorist would stop after hitting someone? Not like you’re gonna just drive home with a Gerhardt in your windshield. Lou is inclined to agree. 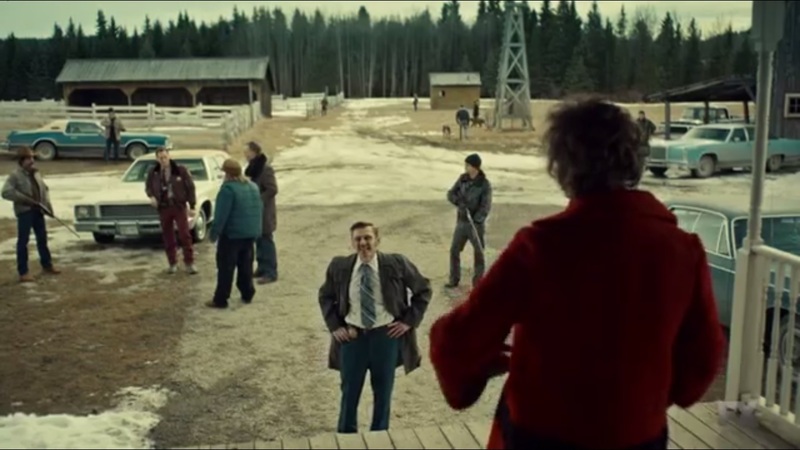 However, rather than looking for men, Betsy suggests that the officers look for a car. Well, at least we know smarts run in Molly’s family. Following this, Peggy stops by the butcher shop to get Ed for an emergency. She fills Ed in on Betsy Solverson’s theory, so they have to deal with the car today. Luckily, Noreen isn’t paying much attention to much of anything outside of her copy of “The Myth of Sisyphus.” When Ed sees the wanted poster, he knows that something must be done. 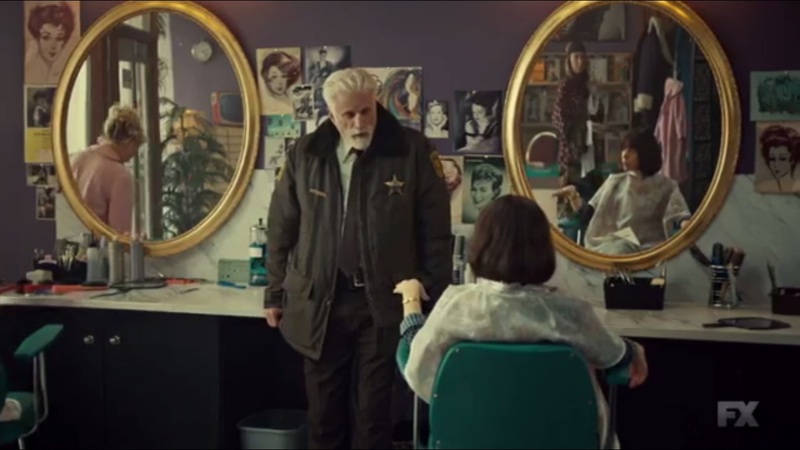 While Molly soaks in some television, we resume with Lou Solverson, who spots a man staring into Judge Mundt’s and then gets spooked before taking a second glance. 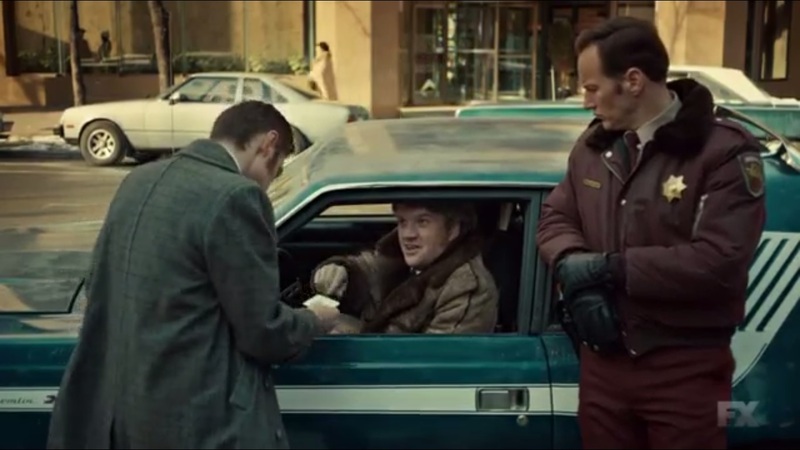 Lou and Ben catch up with Skip at his car and ask for his identification. Skip is his Christian name, didn’t you know? He talks about his business that is all set to reopen and the new typewriter models that will be in any day. They’re not just for women, anymore. So why’s he at court and idling around Judge Mundt’s office? Skip explains that he had a hearing on a small bother related to back taxes, but it’s been postponed. Nothing scandalous, but time sensitive on account of needing cash to cover the new models. Is that why he went by Judge Mundt’s office? Well, he heard what happened and wanted to pay his condolences. Lives hang in the balance. And typewriters. Lou figures Skip for a squirrelly fellow. He figures Skip should be brought in for questioning, but Schmidt disagrees. And it’d be a hassle to go through Mundt’s cases. He cuts Skip loose. Skip then rushes to Rye’s apartment and knocks on his door, but ends up meeting Simone instead. Simone figures that Skip could use a drink. Or he can watch her drink and possibly dance. 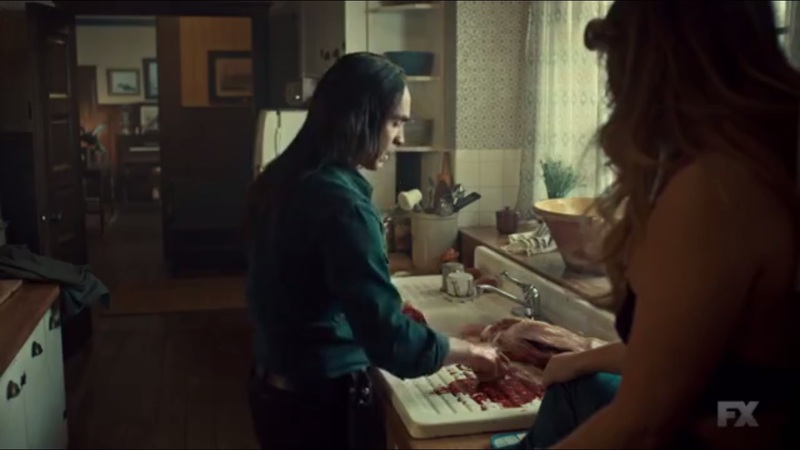 Oh, and Hanzee’s here as well, but Simone assures Skip that Hanzee is boring. Rye spoke of a deal with a fella downtown. Skip not only gives his name, but also admits that he’s here to pay off some debts. And Skip can’t pay Simone because he doesn’t have the money now, but he will. Soon. So yeah, he came by to not pay the money and he’s a patriot to boot. Simone decides that it’s time for a drive. If Skip has any appointments, he’ll be missing them. 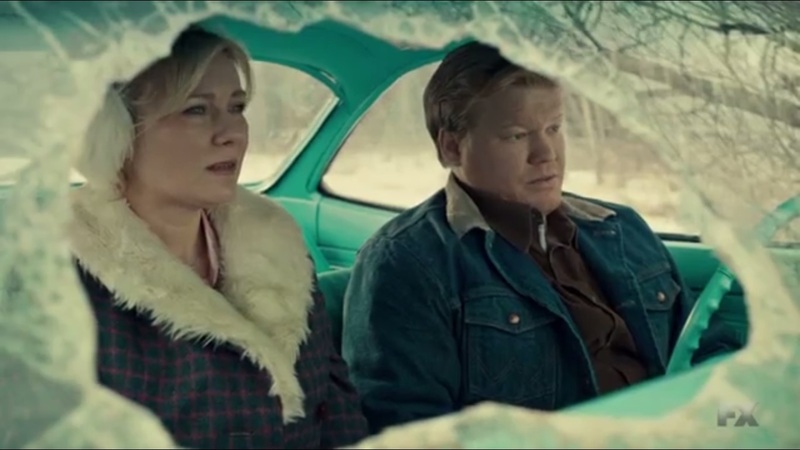 Ed and Peggy drive to an icy, remote location to put a possibly stupid plan into place…a plan that involves a tree in the distance. See, Peggy’s uncle used to drive his truck while drinking Old Milwaukee. After every crack-up, he’d drive his truck to some deserted spot till he sobered up, fake a new accident to cover the damage he did drinking. So, Ed and Peggy do the damage, file a report, and their problem is solved. Peggy gets out and Ed cautions her to watch her toes. With that, he speeds towards the tree. A repair crew shows up soon after to pick up the car. He got it right the second time afterward. Ed figures that he got the whiplash. If anyone asks, Peggy backed into the garage door. Back at House Gerhardt, Charlie talks to Bear. Floyd thinks that a piece of the business can be sold to Kansas City. Bear worries that if Charles doesn’t return to school, he’ll run astray and not make something of himself. But, Charlie argues, he is something- a Gerhardt. Bear argues that this is not negotiable. And Dodd has nothing to do with this- Charlie is Bear’s son. Lou and Schmidt arrive at the Gerhardt compound and meet with Floyd Gerhardt. Floyd is familiar with Schmidt, but is unfamiliar with this new cop from Minnesota. The two fill her in on the murder investigation, including the death of a state judge. Lou tells the family that Rye’s prints are on the murder weapon. Now, he’s wanted in connection with three murders, Lou says, and he doesn’t want to resort to violence. Then, Dodd arrives. He doesn’t think that Rye killed a judge since the family owns all the judges. Lou admits to Dodd that he, not Ben, found the murder weapon, so if Dodd has problems and wants to dance, he’ll have to tangle with Lou. Lou isn’t scared off by Dodd trying to intimidate him, even to the point where the two almost come to blows. In addition, Lou mentions that one Mike Milligan may also be looking for Rye. Charles informs Dodd that Hanzee called for an important matter. Confrontation averted for now. In town, Lou figures that he can get a warrant to search the Gerhardt premises. As luck would have it, the two happen upon Skip’s typewriter shop. Ben has an excuse, but Lou can go it alone. I suppose it’s a good thing this is apparently the only typewriter shop in town and Lou has a pretty good hunch. Anyway, Lou finds the door ajar and enters to find the shop under construction…as well as Mike Milligan and the Kitchen brothers. Lou claims to have met the owner, so Mike can’t be him. Lou asks if these folks are indeed Mike Milligan and the Kitchen brothers…which sounds like a band name. That is a great name, I must admit. 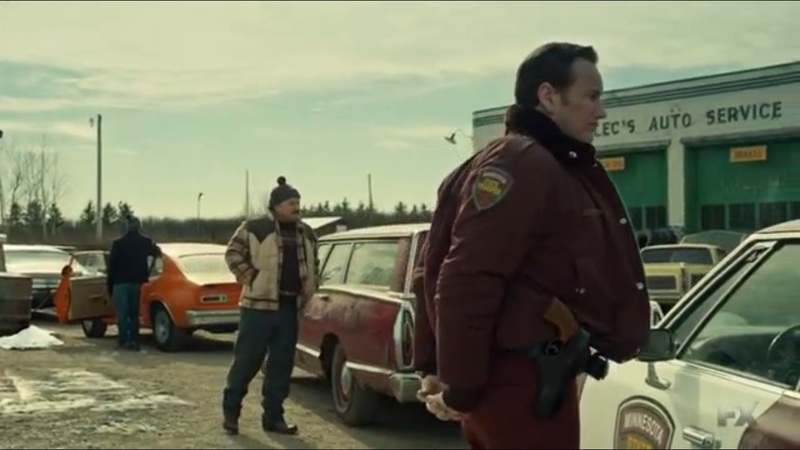 Mike points out that, as a Minnesota cop, Lou is out of his jurisdiction to be in North Dakota. Mike mentions he saw another guy from Minnesota- he liked him as much as he likes Lou. Not that Hank was friendly. 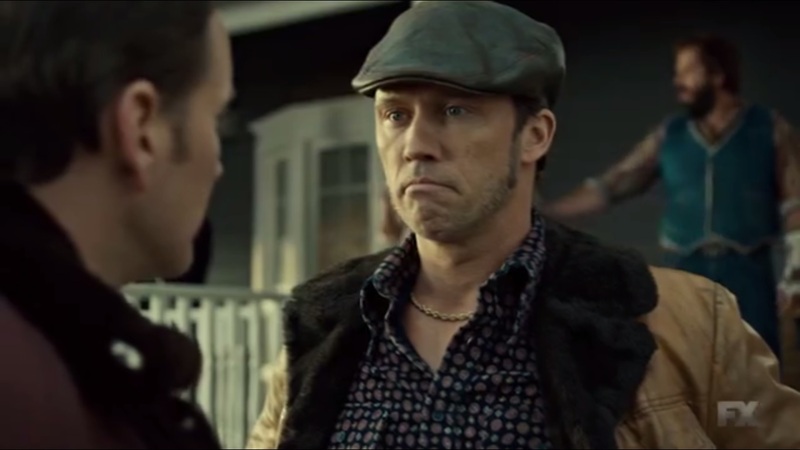 But it’s the way Hank was unfriendly…he was so polite about it, like he did Mike a favor. After the standoff subsides, Mike and the brothers leave. Also, Mike swears to Lou that he is not a crook. I wonder who else said that. Later, Lou stops by Alec’s Auto Services. One of the owners talks about circular patterns in the sky. The visitors always come in sets of three during the odd months. Visitors from above, yeah. They apparently take up people and probe them in places you don’t want to mention. Strange happenings. 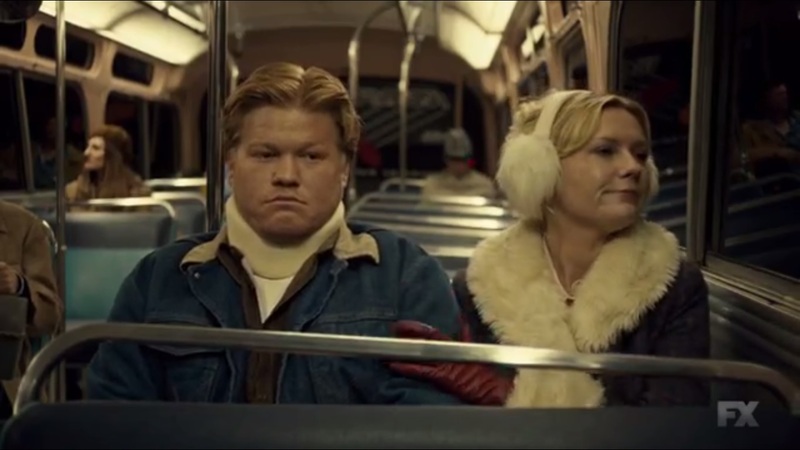 That evening, on a bus ride home, Ed and Peggy wonder whether their plan worked. Peggy is sure that it did, though there’s no way she could be so sure. 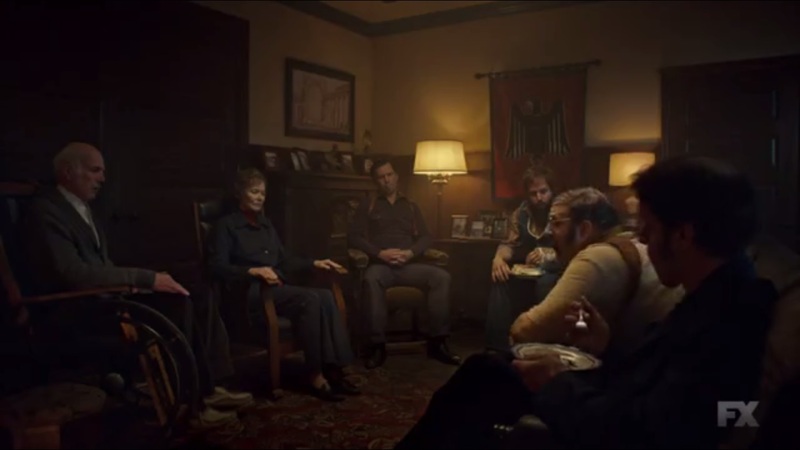 Meanwhile, Lou returns home to find Hank and Betsy playing a game of cards. Lou fills in Hank on his run in with the Gerhardt and the Kansas City syndicate. So maybe Lou will needs two pieces of cake, but Betsy only brings one. How selfish of her. That evening, Dodd and Hanzee get ready to deal with Skip. Dodd orders Simone to get back in the truck and even smacks her across the face, even though she’s the one who found him. Simone dares Dodd to hit her again, but instead, he throws her back into the truck. Dodd confronts Skip about the ideas he put into Rye’s head over the typewriters, the meeting with the judge- everything. Where is he now? Skip claims to not know about Rye’s location and says that he didn’t talk to the police, either. 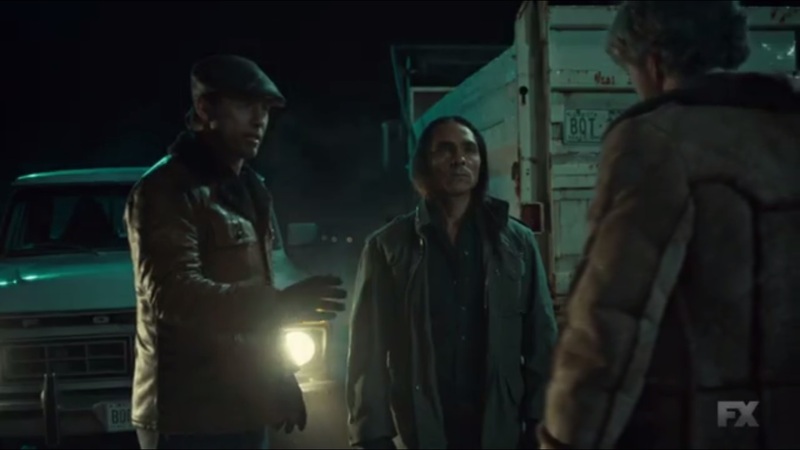 By the way, there’s an open hole in the ground nearby and Hanzee orders him to get in the ground. Skip asks for two days in order to find Rye. He eventually spills that Mike Milligan came looking for Rye. 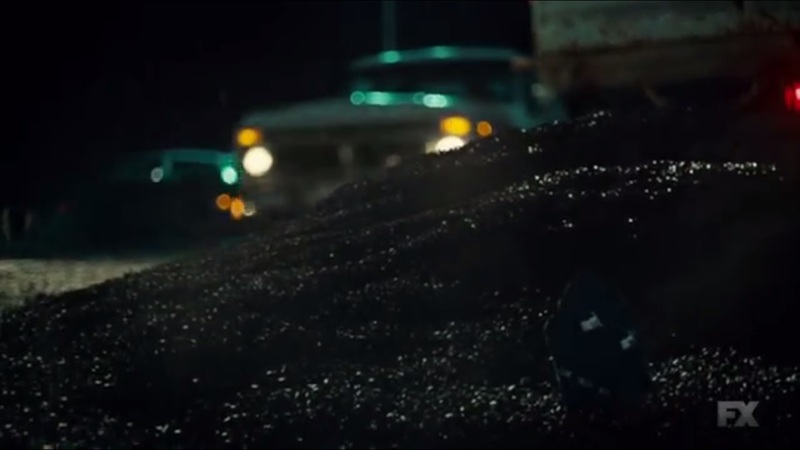 Though he offers to make a call, Skip’s life comes to a close as the truck backs up and empties its load onto the grave. Dodd orders Hanzee to drive to that Minnesota town to find Rye. If anyone gets in Hanzee’s way, kill them dead. 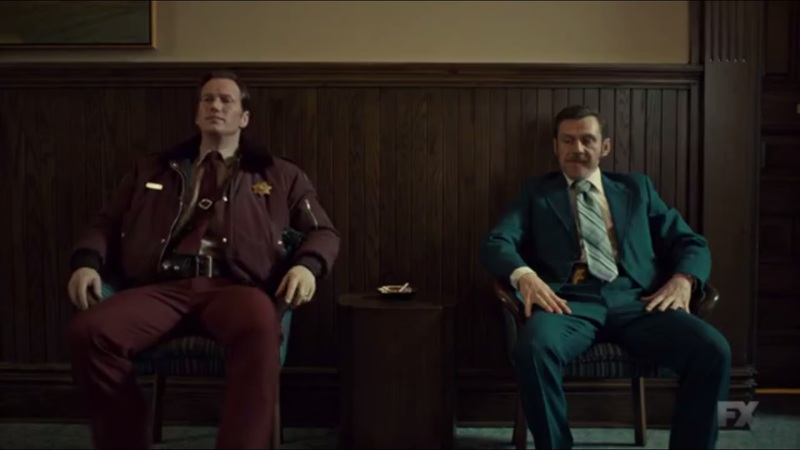 Fargo’s strength, in my opinion, doesn’t come from the level of violence or brutality, harsh as it can be. The show and film excel because of the dialogue and the threat of violence, not necessarily the act itself. 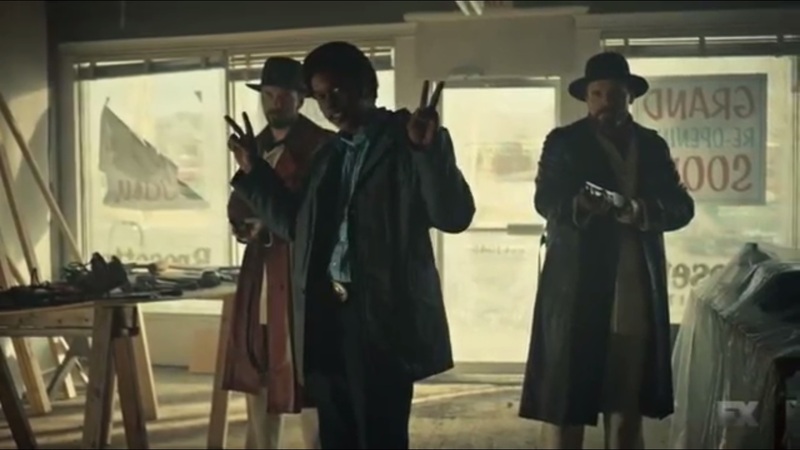 If you’re a great writer and director, coupled with a competent cast and staff, you can pull off tense situations without the use of violence at all. “The Myth of Sisyphus” doesn’t have anything excessive in it and there’s no shootout, but the constant threat of it is always there as the separate storylines intersect and everyone tries to get to the bottom of their respective matters. Right now, Mike Milligan and the Kitchen Brothers are a step ahead of the authorities and haven’t had to make any major moves yet. For now, they’re still in the planning phase because they’re hoping to turn Rye against his family. We don’t know yet just how much influence and power this syndicate possesses, but they carry a great deal of presence. It also helps that while there may be something off about them, there’s no reason to treat them as suspects at the moment because they haven’t done anything. But Lou, as we saw last season and now, he has a sixth sense when things don’t add up right. And even when confronted with a dangerous situation, he refuses to back down and cower. Lou has been to war. He’s seen horrid things that bring out the worst in people and lived to tell the tale. He’s not a braggart. Lou sticks to his guns and while some, like Schmidt, may think he’s overstepping his boundaries, he has a job to do. He may have evaded conflict with Milligan, but I get the feeling that it rattled him a bit, after feeling empowered when confronting Dodd. I like that we see more of an assertive side to Lou here. No blood is shed- no human blood, anyway- but Lou gets dangerously close. Twice, in fact, as he’s able to get under Dodd’s skin. Again, he’s not doing it to show off, but it’s his mission to get to the bottom of this murder and a brute like Dodd won’t keep him from that. Though this case may be different than what Lou is used to, he walks into it with the same determination as he would other cases. He doesn’t throw Mike Milligan off, though, but he’s at least able to stand his ground in the face of what could have been a deadly situation. Like Malvo, Mike Milligan is a man with no fear. We don’t know much about him, but you get the feeling that a situation could escalate fast when he’s around. Maybe it’s the smile or delivery, but he’s so unassertive that you wouldn’t think he had a bad bone in him. But he also wants to avoid a confrontation because it’s not worth his time. That was a constant in this episode: avoiding the firefight. Or at least not wanting to make the first move. Every confrontation felt like a game of Chicken. The Gerhardt family has firepower and backing, but they’re not willing to strike unless they’re attacked first. They won’t shoot Lou because he’s an officer of the law, and Lou won’t shoot them because that won’t help his investigation. It’s too soon to come to blows because no one has the full picture. Ed and Peggy are the only ones right now who know what happened to Rye, but no one’s pointing the finger at them just yet. In fact, aside from what Constance knows about the car, there’d be no reason for anyone to assume they’re involved. And yet, they’re going to great lengths to cover a trail that no one may be following. If anything, the cover story gives us another look at Peggy’s twisted thinking. 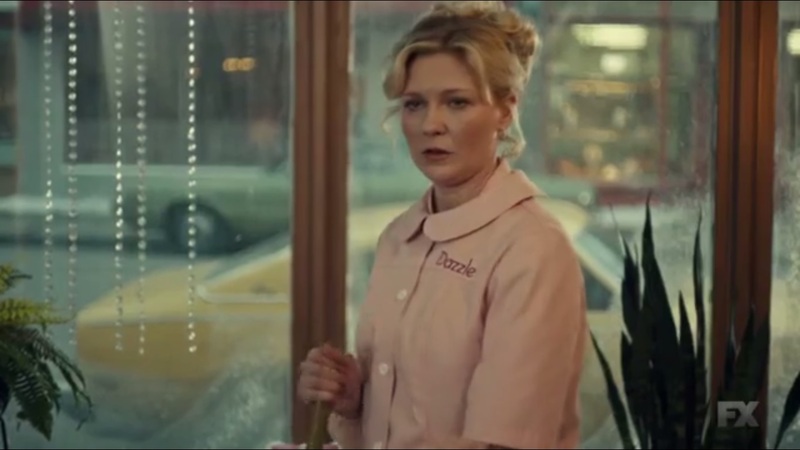 The scene in the beauty shop was another tense moment because of the sheer fear on Peggy’s face, helped by Kirsten Dunst’s performance. Hank and Lou wouldn’t have a reason to look at the Blomquists because, as of now, there’s nothing tying them to the Gerhardt family. 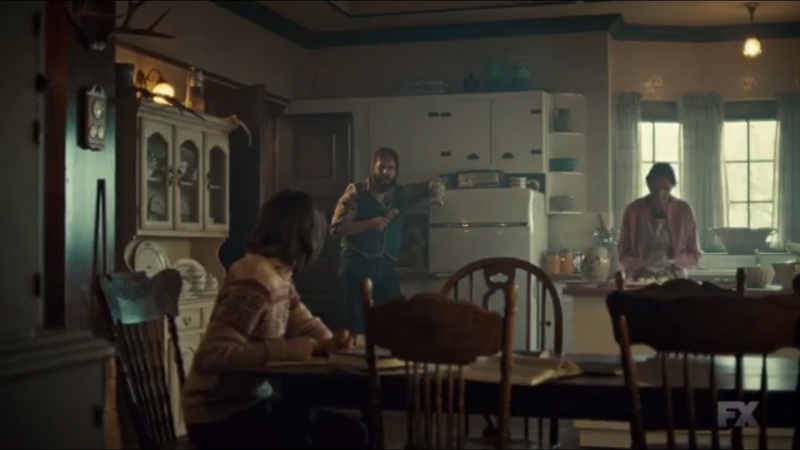 But the mere idea that Betsy could point Hank in Peggy’s direction based on nothing more than a wild hunch shows that Peggy and Ed aren’t completely in the clear. It also goes to show just how smart the Solversons are, and while Hank doesn’t think much of Betsy’s theory, Lou isn’t one to just let something go. Like how he found Skip squirrelly or Mike Milligan suspicious, Lou may latch onto that as a reason to question Ed and Peggy. Plus, Constance saw the damaged car and Ed didn’t get the crash right the first time, so their problems are far from over. “The Myth of Sisyphus” was good. Some good tension as the various factions crossed paths with no one firing a single shot. Peggy and Ed think their problems are over, but far from it. Meanwhile, the investigation and search for Rye from all sides continues. Not for Skip, though, but hey- at least he died a Patriot. This entry was posted in Fargo and tagged Allan Dobrescu, Angus Sampson, Bear Gerhardt, Ben Schmidt, Betsy Solverson, Bob DeLaurentis, Bokeem Woodbine, Brad Garrett, Brad Mann, Charlie Gerhardt, Constance Heck, Craig Wrobleski, Cristin Milioti, Dodd Gerhardt, Ed Blomquist, Elizabeth Marvel, Emily Haine, Ethan Coen, Fargo, Floyd Gerhardt, FX, Gale Kitchen, Gloria Wuddle, Hank Larsson, Hanzee Dent, Jean Smart, Jeffrey Donovan, Jesse Plemons, Joe Bulo, Joel Coen, Kate Corbett, Keir O'Donnell, Kirsten Dunst, Lou Solverson, Luverne, Michael Hogan, Michael Uppendahl, Mike Bradecich, Mike Milligan, Minnesota, Molly Solverson, Noah Hawley, Noreen Vanderslice, Otto Gerhardt, Patrick Wilson, Peggy Blomquist, Rachel Keller, Raven Stewart, Samuel Marty, Simone Gerhardt, Skip Sprang, Ted Danson, Todd Mann, Wayne Kitchen, Zahn McClarnon by omarid513. Bookmark the permalink.